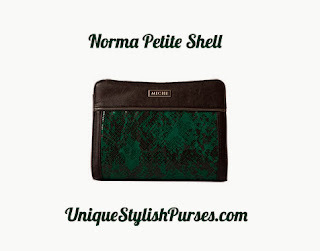 And Norma for Petite bags certainly delivers on sexiness—she’s perfect for holiday parties, that date with your special guy, or really anytime you want to feel powerful yet feminine. Glossy emerald snake faux leather features dark grey piping and black accents. Just add handles of your choice!